By Abdur Razzaq, Member of the Bar of England and Wales and the Supreme Court Bar Association of England and Wales. He serves as Lead Counsel at the Bangladesh International Crimes Tribunal and has worked alongside 9 Bedford Row International since January 2011. TODAY’S crisis has two origins: one judgment and one amendment. The judgment is the May 2011 Supreme Court judgment which declared elections under a caretaker government unconstitutional. The amendment is the June 2011 fifteenth amendment to the Constitution which abolished elections under a caretaker government. Constitution making is a Herculean task. It should reflect people’s will and be legally sound. It took almost 11 years to frame the American Constitution, 9 years to frame Pakistan’s first Constitution, 3 years to frame the Indian Constitution, and 2 years to frame the French Constitution. Amendment to the Constitution is nearly as difficult as its framing. In July 2010, on the prime minister’s proposal, a 15-member parliamentary committee was formed to amend the Constitution. 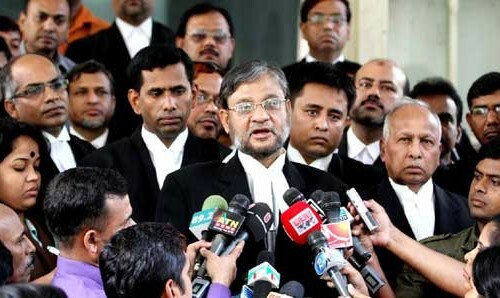 Over a period of 8 months, the committee, consisting of all the front ranking leaders of the ruling alliance, consulted former chief justices, members of the legal profession, members of the civil society, representatives of political parties, and came to a unanimous decision to keep the caretaker system intact. In a meeting of the committee held in April 2011, the prime minister opined that the life-time of the caretaker government should be limited; but she did not ask for its abolition. On May 29 the committee proposed to limit the life-time of the caretaker government to a maximum of 90 days. A day later, on May 30, the committee met the prime minister and made a U-turn, and decided to abolish the caretaker system. The only reason cited by the ruling party for this ‘historic’ U-turn is the Supreme Court’s judgment of early May, which declared the caretaker system unconstitutional, although the same judgment permitted the government to hold the next two elections under a caretaker government. The truth of the matter is that it was the wish of the prime minister to abolish the caretaker system. Two thirds majority in Parliament is not always conducive to democracy. In 1983, during her second term, British Prime Minister Margaret Thatcher obtained a huge majority in parliament. Francis Pym, a senior member of her conservative party, expressed concern that such a huge majority might not be good for Britain. In 1971, Prime Minister Indrira Gandhi’s Congress party obtained 352 seats out of total 518. In 1975 she declared emergency and ultimately lost the 1977 elections. In Bangladesh, in 1975, if the ruling party did not have two thirds majority, Baksal could not have been formed and our political history perhaps would have been different. In Turkey, in 2011, The Economist urged the Turkish electorate not to give Prime Minister Erdogan’s AK party a two third majority because that would be bad for Turkish democracy. In Bangladesh, by dint of a two-thirds majority, the fifteenth amendment has made so many changes to the Constitution (including making certain provisions un-amendable), that it surprised both the constitution experts and the constitution framers. On a different note, an argument is now being advanced that the Constitution, in certain respects, has become unworkable. An all powerful prime minister now reigns supreme. The head of the state, the president, has very little role to play in the affairs of the state. Once an election is held, the winner takes all. It is argued that to bring a balance, the president should be given more powers, and proportional representation, in a limited way, should be introduced to bring some checks and balances in parliament. Bangladesh has not only come out of the sad days of a ‘basket case country’ but has, in many respects, according to the London based Legatum Institute, outdone its ‘BRICK-branded’ big neighbour India. Sadly, it is only our sick politics which is pulling us down. On the caretaker issue, a problem has been created wholly unnecessarily. More than one opinion poll suggests that 90% of the people support a neutral non-party government during the elections. If the ruling party is in doubt it can go for referendum on this issue as is done in mature democracies. In 1975, Britain went to referendum on the issue of its entry into the European Community. Four decades on, by the end of 2017 — if not earlier — it will again go for a referendum on the issue of its exit from the European Union. In September next year, Scotland will go for a referendum to decide whether to remain within Britain or be independent. Bangladesh will have sufficient time to go for a referendum and amend the Constitution before the elections and, if necessary, ways and means can be found to postpone the election legally beyond January 24. It is for this government to find a way out of this crisis. Non-participatory elections will not solve, rather it will deepen, the crisis. The duty of a politician is to avert crisis, not to create one. The world will remember President John Kennedy for averting a nuclear war in October 1962 with the Soviet Union during the Cuban missile crisis despite contrary advice given by his advisers. Nelson Mandela saved his country form a blood-bath by compromising with his arch-enemy. Today’s politics with all its violence — the shutdowns, the burnings the killings and maiming — are nothing but a repetition of the politics of two decades past. The 160 million people deserve better. Of late, Bangladesh has been on the international radar. Particularly, the recent New York Times editorial was very critical of the government and spoke of international sanctions. The country on the eve of its 43rd birthday is facing a sea of uncertainty. Tragedies similar to Shakespeare’s Macbeth have taken place more than once in Bangladesh. The country cannot afford a repetition of those tragedies.